I was on Pinterest (also known as my happy place on the internet) and in my feed an image popped up with the title “8 MOVES TO GET RID OF THUNDER THIGHS” with the backside of a woman who in my humble opinion looks fantastic (not skinny fantastic, but great all the same). She just happened to not have a slender body type, but she looked good for her body type. Thunder Thighs? It struck me how harmful that kind of thinking is to people. First of all, anyone that knows anything about fitness knows that while you can focus on toning and building muscle you can’t burn fat from one specific area (that isn’t how biology works) and so it is a pretty misleading blog post. But moreover, why must they be “thunder thighs” and if they must why must that be a bad thing? I’m all for self-improvement, but not at the cost of cutting ourselves and other women down. The greatest tool for success is cultivating a positive body image now. It takes time, but taking care of your mental health is priority one in creating a healthy lifestyle. I often rush around and don’t take a ton of time infront of the mirror, but this morning I took a long look at my naked body in a full length mirror and you know what? I was not only not horrified, but I actually looked at myself and appreciated my beauty. I popped my hip and looked and my tummy and legs and the full curves of my body and I appreciated their beauty right now. Yes, I want to lose weight and trim down. I want to be stronger, more compact, but I have to be honest that I looked at my body this morning and thought how beautiful it looked (like a marble statue I’d see at a a museum). In my own way, I am a very beautiful woman right now. I of course could easily pick myself apart, but why? It is those negative thought patterns that get in the way of our dreams. Believing that you are the before picture is a sad way to live today and gets in the way of living a full life now. Also, it is by loving myself that I get stronger and healthier. This past weekend I created a little vision board for myself. I am not big into the woo-woo of creating a vision and it will happen (you have to work for what you want too). I believe that if you work hard towards something and remind yourself of it often you can be very successful in your goals. I also strongly believe in focusing on positivity wherever you can. I included a couple images from one of my most memorable and important runs (Snowbird in Utah), because while it can help to look at other people’s bodies and my body was far from perfect in that moment I have rarely felt so powerful in spirit. It reminds me that I am little, but fierce (thanks Shakespeare for that gem!). I only chose uplifting images (no body shaming or unrealistic ideal bodies). 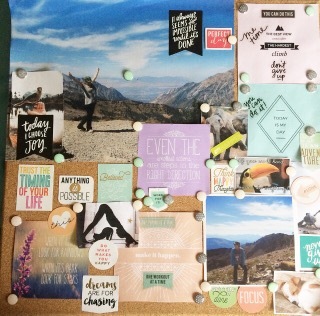 If you are looking to create your own vision board I suggest images that speak to your heart. Pick images that lift you up, images that speak to spoken and unspoken dreams, and things that genuinely make you smile. Don’t pick images that pull you or others down. If you put images of other people’s bodies make sure they inspire you and you don’t compare yourself in an unhealthy way. Create a positive vision that helps you take time love yourself more, not one that urges you to banish your thunder.